Frankie’s Tiki Room, Las Vegas – A topnotch tiki bar with awesome decor, delicious drinks and several custom tiki mugs — plus it’s open 24 hours a day. It’s also on my list of the Top Tiki Bars in the United States. 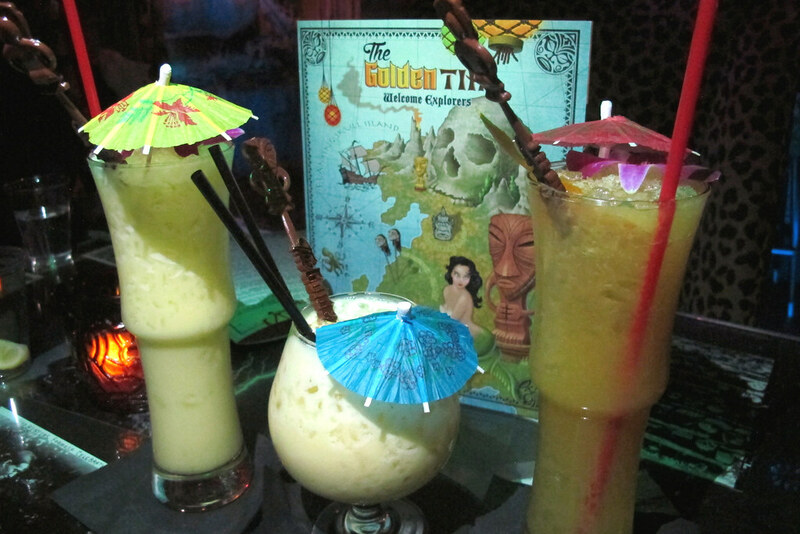 The Golden Tiki, Las Vegas – Dole Whip with rum… A skeleton that swears… The Golden Tiki in Vegas is like Disneyland designed just for adults. It’s also open 24 hours a day. Cheeseburger Las Vegas – The food’s not very good, but the decor is ok and they sell a cute tiki mug holding a cheeseburger. Trader Vic’s Las Vegas – Great views of The Strip was one of the few things this not-very-tiki location of Trader Vic’s had going for it. It closed in 2009.